The story begins with a huge tree crashing through the back of a home during a storm. The homeowners called us for help and we got to work right away. We repaired the family room ceiling, which had a big hole in it. Then, out of this misfortune came an opportunity for our new clients to finally have the kitchen of their dreams. 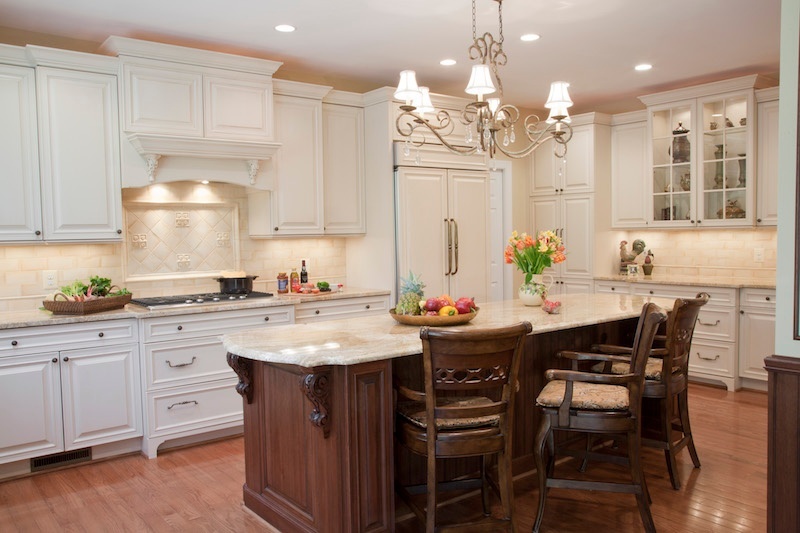 After extensive design consultation and preparation, we completely remodeled the kitchen and created a larger space by bumping out the existing walls. The new kitchen was light and airy, transitional in style and highly functional. It was exactly what our clients had envisioned! 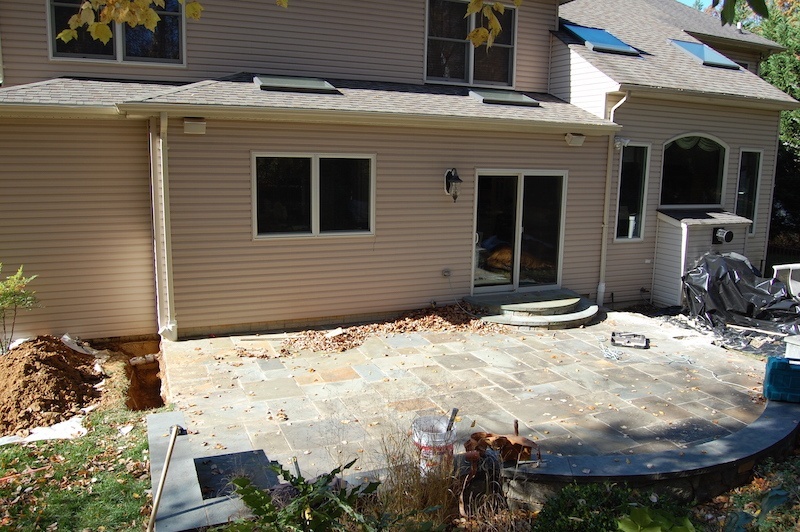 As part of the kitchen renovation, we installed a sliding door that led to a new free-form flagstone patio. 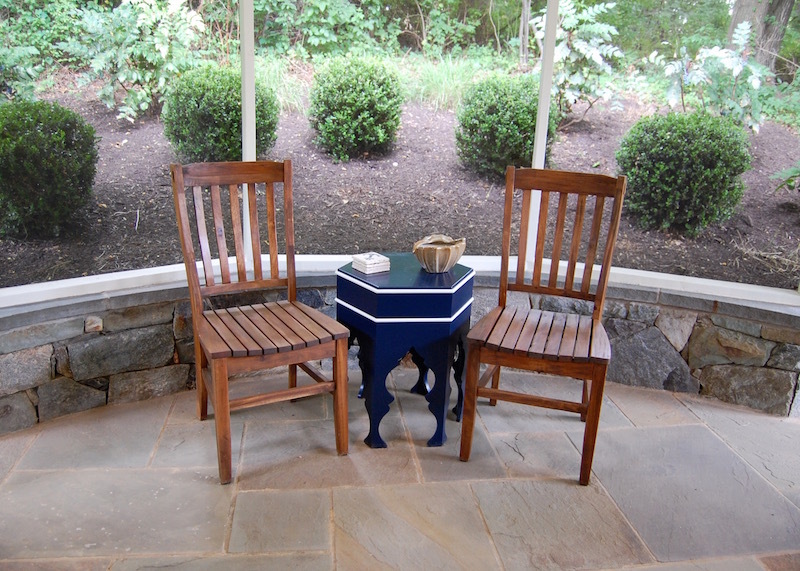 The large patio provided a much-needed place for barbecuing and entertaining family and friends. 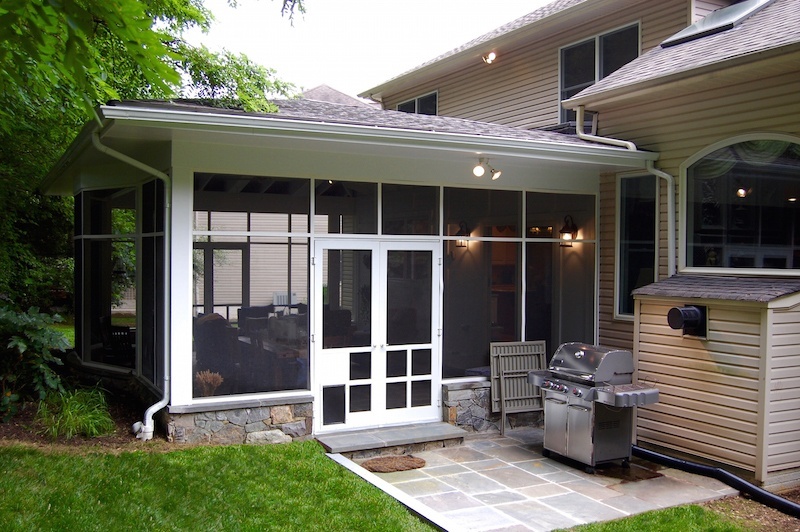 Our clients discovered that the hot, buggy, muggy summer weather that is prevalent in the Washington, DC area limited the time that they were using their patio. So three years later, we were asked to create an indoor/outdoor living space that the family would be able to use in spring, summer and fall. 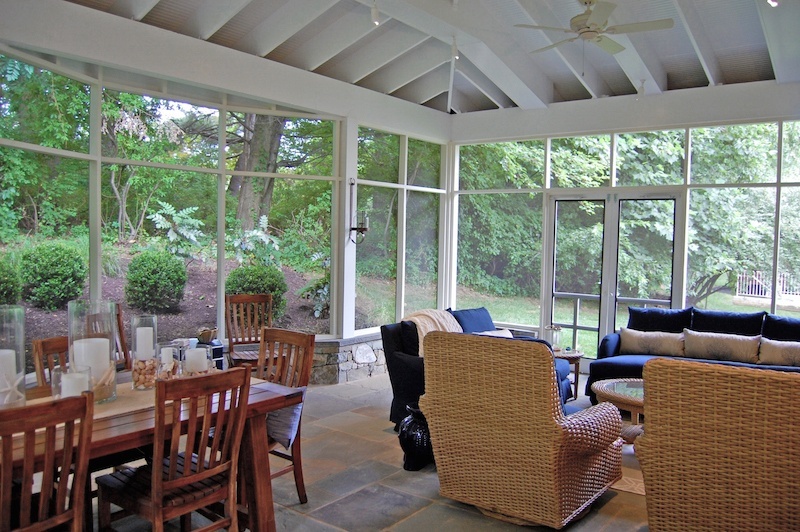 Our suggestion was to build an expansive Nantucket-style screened-in porch that included the existing flagstone floor and retaining walls. The design for the beautiful new indoor and outdoor living space included a tongue-and-groove ceiling and exposed rafters, all in white. Paddle fans were installed to deliver a cool breeze and low voltage fixtures provided the perfect lighting. A wall-mounted television would allow the family to watch football comfortably in the cool fall weather on their new screened-in porch, too. Now, there would be plenty of space for our clients to entertain or just hang out in comfort on sunny or rainy days. Of course, the most important feature of the new screened-in porch was the doggie door that would allow the family dog to go outside independently. 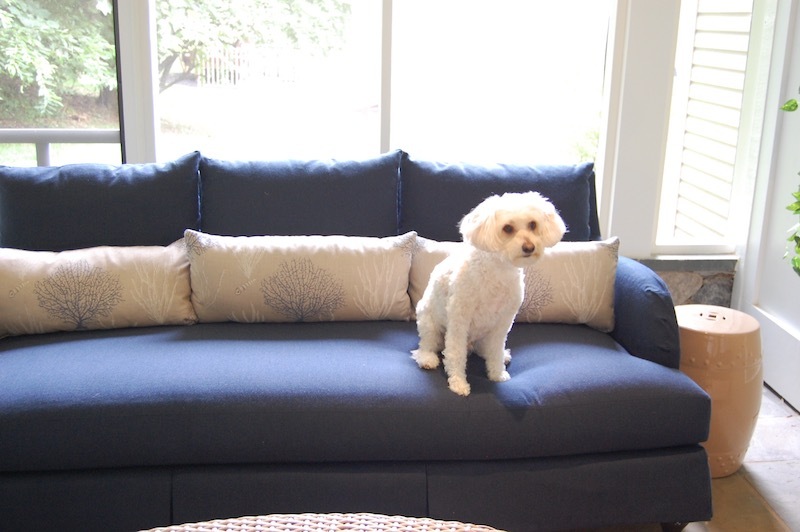 The comfy couches also gave him a place to nap in a warm patch of sunlight! Interested in creating a beautiful and functional new space of your own? The popularity of indoor/outdoor living has exploded in the last five years, prompting many homeowners to reevaluate their family's lifestyle and entertaining preferences. Need some ideas? Click here to see images of some of our other projects for inspiration!